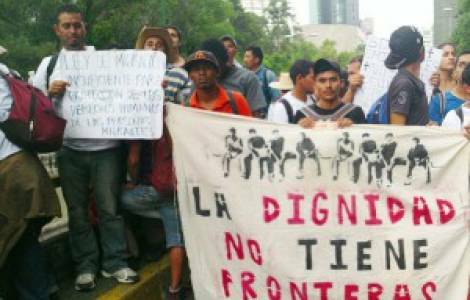 AMERICA/MEXICO - For the first time the Bishops address the citizens of Mexico and United States "for the dignity of migrants"
Mexico City (Agenzia Fides) - "For the first time in history, the Bishops address the citizens of Mexico and the United States, regardless of their religious convictions, and in a special way and with great respect, to the Presidents of our respective Countries, because of the deployment of the troops of the North American National Guard on the border that delimits our territories". This is how the "statement made yesterday by the Bishops of Mexico's northern border and the Council of Presidency of the Mexican Bishops' Conference", signed on April 7, 2018 and released this weekend, entitled "For the dignity of migrants" begins. In the text, sent to Agenzia Fides, it is emphasized that the Catholic Church "cannot ignore the suffering of our migrant brothers and sisters who seek better living conditions when they cross the border to work and contribute to the common good not only of their families, but also of the brother country that receives them". In the awareness that "present and future migratory flows require new regulation by both nations", the Bishops emphasize that "not all rules, political or military decisions, simply because they are promulgated or defined, are in themselves just and in conformity with human rights". They therefore observe that "the inalienable dignity of the human person is the true source of law, it is that the pain of the weakest must be understood as the supreme norm and fundamental criterion for the development of peoples and for the construction of a peaceful future". The Mexican Bishops reaffirm what they already said a year ago: "the cry of migrants is our cry. Their pain is our pain! For each immigrant wounded in their dignity and rights, Jesus Christ is crucified again!". The statement states "past and present Mexican governments have a serious responsibility for not having created sufficient development opportunities for our poor and marginalized people". In the upcoming elections on July 1st (see Fides 21/3/2018) Mexicans will therefore have to "choose those who must implement honestly, without corruption and impunity, a historic change that will help the people of Mexico to be the true the protagonist of its development, in peace, justice and full respect for human rights". The statement strongly emphasizes that the shortcomings of Mexicans cannot be justified in order to "promote antagonism among the peoples... It is not appropriate for human dignity and the best reasons and arguments conceived by men like Abraham Lincoln or Bartolomé de las Casas to build barriers that separate us or develop actions that hurt us. Migrants are not criminals but vulnerable people who have the full right to personal and community development". For these reasons the Church, at a universal level and in particular through the work carried out among brother peoples, gives "due attention to our migrant brothers", in the firm conviction that "there is a future only in the promotion and defense of equal dignity and equal freedom among human beings". The Mexican Bishops join the voice of the Bishops of the United States to affirm with determination that the border between Mexico and the United States "is not a war zone" ... "On the contrary, this area is an example of connection and co-responsibility. The only possible future is built with bridges of trust and shared development, not with walls of unworthiness and violence".